Last week I received a really nice surprise from Gabriela, a fellow foodie on Foodbuzz and the author of Our Earth Land. She awarded me with the Versatile Blogger Award! Therefore, with this opportunity, I would like to thank her one more time for the honour she gave to my blog. 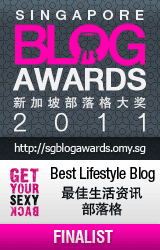 The Versatile Blog Award (VBA). As per the VBA's traditions, upon receiving this award, I would have to select 15 blogs that I find amusing (and informative) and follow them regularly; then award them with this Versatile Blogger Award too. Here are my 15 picks and congratulations to all of you. Also, some of you may have received this award from other fellow bloggers before but as you can see, I could not help selecting you again. I find making cakes or cookies therapeutic. I don't really cook. I don't eat so much red meat. I guess I am into the Blood Type A Diet. The only exercises I confidently do on regular basis are swimming and (slow) walking in the city park or shopping malls. I have weak knees - that's why I do not run, at all. I can't stand cluttered and messy places, so yes; I get irritated and often frustrated seeing the house is a wreck. I am very sensitive to (loud) noises. Call me weird. These days, I only keep in touch with my (overseas) friends via on-line chatting, occasional international phone calls and SMSes. Sad but true. I hardly get the chance to hang out with them in the 'real world'. I am still obsessed with stuff in green colour. Thank you again for passing this award to me, Gabriela! Making macarons was in my baking to-do-list before I give birth this September. I tried making a batch of macarons this morning but the results were all flop! I felt disappointed indeed but I realized that my failure was likely because I did not strictly follow the ingredients called in the macaron recipe I used. Since macarons are delicate sweet snacks, they don't really have rooms for mistakes both in the ingredients mixture and baking processes. Anyhow, I continued today's baking frenzy by making a chocolate cake topped with chocolate ganache. I found the chocolate cake recipe from a random magazine clipping but I modified the original recipe here and there to produce moist chocolate cake. Also, I didn't make the Chantilly cream as I should have for the chocolate cake because I failed to make it twice. I over beat the heavy cream (twice) and that said, I had to finally say good bye to making any Chantilly cream as after those two trials, I ran out of heavy cream to whip. The following is the recipe of the chocolate cake I made today. My first trial of making Chocolate Cake with Chocolate Ganache Topping. To make the cake: Grease and line 7-inch round cake pan with parchment paper. Set aside. Sift flour and cocoa powder into a bowl. Set aside. Combine liquid milk and vegetable oil in a bowl. Set aside. Beat egg whites by using high-speed electric mixer until stiff. While beating, gradually add cream of tar-tar. Once the egg whites form soft peaks, set aside. In separate bowl, beat egg yolks and sugar until pale and thick by using high-speed electric mixer. Turn the electric mixer to its slowest speed, alternately pour flour mixture and milk/oil mixture into the (egg yolk and sugar) batter. Do not over beat. Fold the egg whites into the chocolate cake batter by using rubber spatula. Pour the cake batter into the cake pan and bake the cake in a preheated oven (150 degree Celcius) for 30-45 minutes until done. Cool the cake pan for 5-10 minutes, release the cake from the pan, remove the parchment paper from the cake and let the cake cool completely. To make the chocolate ganache: Heat the heavy cream until it comes to boil. Remove the heat and immediately pour the cream onto the chopped cooking chocolate. Stir the mixture until completely mixed, smooth and glossy. Add the instant coffee powder into the chocolate mixture. Mix well. Allow the chocolate ganache to cool before glazing it onto the cake. See further tutorials on making this chocolate ganache here. Decorate the chocolate cake with chocolate ganache as desired. A slice of the chocolate cake I made today. Best serve cold, after keeping the cake in a fridge. Overall, I think I still need to practice more in decorating cake with chocolate ganache to produce a beautiful cake with a really smooth surface topping. Nevertheless, I was quite happy with my first chocolate ganache I made today as it was not too sweet but tasted quite chocolaty - especially with the addition of coffee powder on the mixture which aims to bring stronger chocolate aroma out from the ganache. During the Gynae's talk at the antenatal class that I attended on last Saturday, one of the topics that I very much looked forward to hear was about labour and its pain management. Although the Gynae said that some pregnant mothers in the function room still have few or a couple more months to go to seriously think about childbirth, it does not hurt to have some rough idea or knowledge about labour pains and consider the available options of labour pain relief now. The Gynae is a mother herself and during her session, she described how painful labour pains could be for women and many women in labour usually would not be able to think well when coping with the excruciating pains during labour. Hence, it is important for husband and medical professionals to assist the mother in going through labour pains when the time comes. When the mother screams for pain relief, ideally her Gynae or nurse should be able to comply with her wishes to ease her pains and ensure easier delivery process that is safe for both baby and mother. Pethidine - Pethidine is a painkilling drug that gives 30% pain reduction and sedative effect during labour. The drawback of pethidine is the drowsiness effect on both mother and baby after the drug is administered to the mother's body. The labour pains would not be entirely gone even though the mother has been given this pain killer but at least the mother would be able to sleep for 2-4 hours when struggling with her long and tiring labour. Entonox or laughing gas is a gas or air that the mother could breathe in to reduce the labour pains. It gives 50% pain relief and is proven quite safe if performed correctly. The Gynae said that this gas should be inhaled for 80 seconds whenever the pains come and exhale (or stop inhaling) the gas when there is no contraction. This way, there is actually no medications entering the mother's system and all the side effects of this drug on her body will stop too. Epidural gives 99.9% pain relief during labour but the mother may require local anaesthetic for this procedure. See more information about the cost of epidural in a private hospital in Seremban here. Alternative pain reliefs - I am not sure about the detailed choices of the available alternative labour pain management in Malaysia other than the afore-mentioned options as the Gynae did not really elaborate on this topic during her talk. However, reading this site to get more information about alternative ways in managing labour distress and pains may be useful. Moreover, the Gynae explained that complete cervical dilatation is 10cm and normally, cervical dilatation is 1cm per hour. This said, if a mother is 1cm dilated that means she still has 9 more hours to go to finally deliver her baby. Dilating processes can be faster than the above example as childbirth differs from mother to mother. However, failure to progress on cervical dilation during baby delivery may lead to caesarian section. Also, if not necessary, the Gynae sincerely hoped expectant parents not to medically induce labour as induction often puts the baby inside the uterus in so much distress. All in all, the Gynae advised expectant mothers to be mentally ready for labour and always remember that labour pains are "pains with a purpose"! Finally, for best advice and further reference, we need to directly discuss labour issues and pain relief options with our health care provider or Gynae before we give birth. In the meantime, let's make sure that the baby kicks regularly every single day until he or she is ready to see this world. Good luck to all of us, Moms-to-be! Last Saturday, my husband and I attended our very first Antenatal Class (Parenting Workshop/Mummy and Daddy's Class) in Seremban conducted by the private hospital we usually go for my regular antenatal visits. I booked this class about two weeks ago after my Gynae informed me that the hospital was holding this class sometime in end of June 2012. We paid RM 50 as the registration fee for the one-day parenting class for both Mummy-and Daddy-to-be. The class was held at Royale Bintang Resort and Spa Seremban and there were about 15 couples, including my husband and me, attended the whole day event - during which, we got to meet other expectant parents and saw plenty of very pregnant women who intuitively rub their pregnant bellies whenever they can, just like myself. In case you don't know, antenatal classes (in Malaysia) are usually available to prepare parents-to-be for pregnancy care, labour, birth and early parenting. They may be organized by government or private hospitals, and perhaps also sponsored by some baby or parenting product manufacturers. Just to give a rough idea of the first Antenatal Class in Malaysia that my husband and I participated on last Saturday - below are some blurbs of activities we did during the class which I personally deemed very fun, interesting and much beneficial. I was so looking forward to attend my first antenatal class on Saturday! Right after we registered in the organizer's registration desk, my husband and I received lots of goodies bags from the hospital and event's sponsors. I always have a sweet spot for receiving goodies bags at events so holdings lots of goodies bags and other freebies first thing in the morning, even before the event itself started, already made my Saturday. My goodies bags and me! At about 10am, the organizer officially opened the event and the first morning talk session at the event was about the importance of Stem Cell or Cord Blood Banking hosted by one of the event sponsors, Cell Safe. I myself find that Stem Cell is indeed crucial for the child's (and the parents') well being in the future but the whole thing is kind of pricey. Thus, given other current priorities on hand, my husband and I will likely have to skip investing on this one for the time being. Next, the attendees got to see and listen to some demonstrations and tips from the hospital's nursery nurses on the correct breastfeeding and bathing techniques plus jaundice management for newborns. Exclusive breastfeeding for baby's first six months is still highly recommended and by the way, bathing a newborn baby seems like a very tricky business! Newborn's bathing techniques demonstration by the hospital's nursery nurses. Moving on, a representative from the event sponsor, Mead Johnson, gave a talk on nutrition for pregnant and lactating mother and child. In summary, the speaker emphasized that pregnant mothers do not have to eat for two as they are not carrying another adult in their tummies. Pregnant mothers just need to consume 360 extra calories per day to meet her pregnancy diet. She also mentioned the importance of DHA, Choline, Calcium and Folic Acid for baby's development. The speaker challenged all the participants to listen to her talk carefully as there would be some quizzes and prizes to be won at the end of her talk. I was aiming for Mead Johnson's special baby photo album since the beginning and luckily, I managed to answer one of the speaker's pop quiz questions and brought home the photo album I wanted. A triumphant photo of me and the album photo I won during the pop quiz. I managed to answer the question of the examples of food high in DHA. During the session before lunch, all the participants were introduced to physiotherapy during pregnancy (back care and lamaze techniques demonstration). This demonstration was led by the hospital's physiotherapist to prepare the pregnant mothers' bodies for an easier delivery and faster recovery process after giving birth. Other than teaching the expectant mothers to do some light physical activities to stretch their muscles during pregnancy, she also taught the expectant fathers to give some relaxation massage to ease their wives' back pains and swollen ankles during late pregnancy. I love the latter part the most and have constantly reminded my husband not to forget all the massage techniques after we left the event's venue. The ankle and feet massage techniques demonstration. After lunch, the event was continued with a comprehensive talk on pregnancy and labour from the hospital's practising Gynae, who happens to be my own Gynae. I must say that the Gynae gave really insightful points and real-life case studies on pregnancy care, various types of delivery processes, pain relief options during labour and family planning issues after giving birth. The information shared was very important not only for the expectant mothers to realize and consider but also for the expectant fathers. In conclusion, the Gynae said that we, pregnant mothers, should just enjoy our pregnancy as much as possible and be mentally ready for labour, when the time finally comes. Also, she advised all pregnant mothers to walk a lot or swim regularly to prepare their bodies for natural delivery. Before the event ended, there was a brief healthy cooking demonstration by Royal Bintang Resort and Spa Seremban's Chef. The Chef taught us how to make Salmon Salad and Fettuccine with Mushrooms. I think the first dish was unsafe for pregnant mothers to consume as the recipe calls for raw salmon but the husbands can definitely enjoy this appetizer with no problem at all. Salmon Salad and Fettuccine with Mushroom. Last but not least, the event's organizers held lucky draws to finalize the parenting workshop. Every attending couple got to win one hamper and at the end of the day, it was a matter of bringing a small or big hamper home after the lucky draws! Some of the enticing hampers to give away during the event. That's me accepting a hamper courtesy of Mead Johnson during the lucky draws. Don't you think this parenting workshop was so much fun? What the expectant parents paid for the registration fee was definitely so worth the value of the one-day class like this. After the event, expectant parents went back home loaded with imperative information on pregnancy care and parenthood and all of them had their equal chances to ask many questions on various pregnancy and early parenting topics that most probably can't be all raised during the normal 10 minutes monthly antenatal visit with our Gynaes. Not to mention all the freebies that we took home too. My advice for (first time) expectant parents out there, do not hesitate to sign up and go for similar (antenatal) classes like the above if you have the opportunity! Being informed on the right pregnancy care and early parenting techniques is always good. All this while, I thought pregnancy, especially, its second trisemester would be a walk in the park. I was in good faith that pregnancy’s hardest part would always be the nausea and throwing up episodes in the first trisemester. But I think I was wrong. Unlike what is typically seen on TV, principally during the maternal milk commercials, the whole pregnancy experience of mine thus far is not all calm, easy and stress-free period. I mean pregnancy indeed is beautiful and miraculous moment for every pregnant woman in many ways (remember the cute baby kicks I brag every now and then? ); it's just that sometimes, the physical discomforts that expecting mothers have to go through during the 9 months gestation period are, in my opinion, pretty laborious. On top of so many uncomfortable pregnancy symptoms that intensify on monthly basis, do you know that women’s immune system runs at really low speed when they are pregnant? This means some of them are more prone to catching bugs or viruses out there when they are pregnant than they normally do. I totally understated this part until I fell sick way too many times during my pregnancy. I have probably bored you; hence made you rolled your eyes, with the same old flu/fever/runny nose/sore throat stories in my blog or tweets every other month. However, in all fairness, my husband (plus his wallet) and I are more fed up and worn-out in going through all these series of sickness during my pregnancy. I kid you not but in just two weeks after I recovered from my last bout of runny nose and sore throat, I had agonizing throat infection this week and it was pretty nasty. On Monday evening, my husband had to send me to see a doctor in the hospital’s Emergency Unit to get myself checked and medicated as the hospital’s clinic was not in operation during public holiday. Since I fell pregnant, I think there was only one time when I could manage not seeing doctor before my monthly Gynae visit schedule was due. The rests of the months were filled with seeing the hospital’s general physicians or my Gynae out of the regular schedules because I was ill and not supposed to take over-the-counter medications without doctor’s prescription. When I sought explanation from my Gynae and the Emergency Unit’s doctor in the hospital (during my Gynae’s absence) on why my body is incredibly vulnerable these days, despite my undoubtedly growing (and stronger looking) body size – they gave me the same answer: my dropping immune system. So, my point is – if you are pregnant and feel that you have come down with flu or colds more often than usual, fret not. You are not weird and absolutely not alone. It’s all part and parcel of being pregnant. To prevent our pregnant bodies from falling sick too frequently, I think the least we could do now is to be extra careful with our food intake (say bye-bye to ice cream, cold drinks or deep fried, spicy and oily food), drink plenty of water, have enough rests and try to stay away from people who are ill (because I know their virus would infect our bodies first more than anyone else’s in proximity for the moment!). Also, I personally do not dare taking extra vitamin C or multivitamins in order to boost my immune system when I fall sick during this pregnancy – unless I’m temporarily prescribed with additional vitamins from doctors. For that reason, when I am not feeling well, I just take my pregnancy supplements that my Gynae prescribes me as per normal. Finger crossed – no more flu and its annoying buddies on me until September! On Sunday, I celebrated Father's Day by joining my first baking class in Seremban. It was a demonstration and hands-on baking class led by Chef Kevin Chai (from Kuala Lumpur, I believe). I booked this class a couple months ago for RM 100 to experience a baking class in Malaysia. Participants were told to bring some of baking utensils on their own such as rubber spatula, cake tray, cake knife, mixing bowl, and so on for the hands-on class. The class lasted for 4 hours in total and Chef Kevin Chai did demonstrations and shared tips when making the first three recipes he created himself. During which, participants could stop him any time to ask questions about the ingredients or methods for making the first three cakes namely Fragrant Pear Wholemeal Cake, Mini Chocolate Tarts and Coconut Lime Bars. The inside of Fragrant Pear Wholemeal Cake made by Chef Kevin Chai. Mini Chocolate Tarts: So yummy! Initially I was quite confused and did not know how the not-so-big baking workshop for the baking class could accommodate 20 something participants doing the hands-on course for the last recipe, which was Charlotte Au Chocolat. Apparently, for the hands-on class, the Chef did all the measurement of one recipe (times twenty something as there were more than 20 people joined the class) and whipping of for the mousse. He already prepared ready-to-use base cakes for Charlotte Au Chocolat, then the students were asked to mix the chocolate mousse and do the assembly of Charlotte Au Chocolat themselves before bringing it home. This said, technically, the students did not make their own cakes from scratch but only assembled the cake during the hands-on class. Chef Kevin Chai preparing the 22 recipes of mouse for Charlotte Au Chocolate at one go. Making the mousse for Charlotte Au Chocolat during the hands-on baking class. My Charlotte Au Chocolat ready to take home and put in the freezer. In summary, I think I quite enjoyed the baking class yesterday as it was something novel for me. Although, perhaps in the future I would not join baking classes that only provide demonstrations as we can benefit pretty much the same from watching baking programs on cable TV or YouTube. However, I must say that the 'live' tips from the Chef and some questions raised by the participants during the baking class were quite insightful and we would not be able to get these from TV or YouTube. Also, another issue from the baking class I participated on Sunday was the language barrier - the class was mostly conducted in Cantonese and Malay which are not even my second language. My Charlotte Au Chocolat for Father's Day. I presented the above Charlotte Au Chocolat to my husband for his first Father's Day gift and we ate the cake with our nephews and nieces after we put the cake in the freezer for about 3-4 hours. Happy (belated) Father's Day 2012! It feels like I have not had my good night sleeps for the longest time since I got pregnant. In the first trisemester, although my body was mostly tired, sleeping at night was not so easy for me due to the constant nausea feeling that pretty much hit me day and night. I just want to sleep throughout the night. Frequent trips to the loo - but then again I just can't cut the fluid intakes down before bed time. I am always thirsty. Breathlessness - often times, I feel like someone is sitting on my chest and I literally gasp for air. My husband puts an extra pillow around my back to help me breathe on some nights and it somehow helps a bit. Finding a good position just to fall asleep is a challenge now. The heavenly smell of my pillow doesn't entice me so much anymore. Heartburn - say "No, thank you!" to hot and spicy food for dinner or supper! Increased size of abdomen – sleeping with a tummy in a size of big watermelon is quite something. Weird dreams (and nightmares) - that I think I should harvest my dreams and quickly jot them down first thing in the morning so one day I can collate the plots, put together a novel and be famous like the author of Twilight. Joint pains - I know I am turning 28 y/o this year, not 80 y/o. Unbearable hunger pangs - if I don't eat my heavy dinner or miss my supper, hunger can certainly wake me up from my slumber. Strong baby kicks - which I adore and there’s never a dull moment with those cute kicks. Having said this, nowadays, it is not too uncommon for me to toss and turn around in my bed before I doze off or even find myself wide awake in the wee hours. I can even hear the sound of mice running around in the ceiling late at night and unfortunately, the noise doesn't give the same effect in lulling one to sleep as counting sheep. As a result, I get headaches and grouchy on the next day. Oh well, the joy of being pregnant. Can't imagine how I'd cope with nursing my new-born every two hours at night. God, please help me. P/S: My husband, if you read this post, I guess it’s time for you to set the mouse traps again. This is me and my tummy at 26 weeks or 6 months pregnant. I am trying to embrace all the changes in my body during this pregnancy. About 26 weeks pregnant and already gained 10kg. Whenever my husband notices that my tummy has grown bigger and bigger each day, he is happy (for our little one who is joyfully maturing inside me) yet pities me at the same time. He is sad to see how my tummy skin has been extensively stretched, until it feels so tight, to accommodate our growing baby and my expanding uterus. But hey, it's just one of the sacrifices a woman makes for her baby, right? I just did a flash baking frenzy again. This late afternoon, after a quick browse in the internet, I decided to make a Sponge Cake based on the recipe from this source. I don't know why but I have been using lots of allrecipe.com's cake recipes these days. I myself have made Chiffon Cake several times but never did any Sponge Cake before. I find the methods in making these two cakes are fairly the same; it's just that there is no vegetable oil or butter involved in making Sponge Cake. In addition, Sponge Cake's final result has aerated texture, similar to a sea sponge, as compared to Chiffon Cake's. I used half of the ingredients stated in the above original recipe as there were only 5 eggs left in our kitchen. I did not have any lemon extract or zest either, so I decided to flavour my Sponge Cake with mocha pasta. Check out the below recipe that I used for creating my Mocha Marble Sponge Cake earlier today. See the aerated texture of this cake? In a large mixing bowl, beat the egg whites by using high-speed electric mixer. Then, gradually add the cream of tar tar into it. Keep beating the egg whites until they are firm and form soft peaks. Set aside. In a separate mixing bowl, beat the egg yolks until thick. Beat in sugar gradually. Add water. Use high-speed electric mixer for this. Turn the electric mixer to its slowest speed and gradually add the cake flour into the egg yolk mixture. Beat until the mixture just combined. Don't over beat. Fold the egg yolk and flour mixture into the whipped egg whites by using rubber spatula. Divide the cake batter into two. Give half of the cake batter mocha pasta and mix well. Leave the other half cake batter white as it is. Alternately pour the white and mocha cake batters into a cake pan already lined with parchment paper. Once done with pouring both cake batters into the pan, gently shake the pan a little bit to release the air and even the cake batter. Bake the cake in a preheated oven for 50-60 minutes, or until done. Whipping the cake batter for this Sponge Cake is not hard at all and relatively fast too. Furthermore, if the recipe is well followed, it's almost guaranteed that we'd get a soft, light and spongy cake texture. Yesterday, I was due to see my Gynae for my antenatal monthly visit and this time around, my husband managed to accompany me. Earlier in the week, I asked my husband to remind me mention my three current major pregnancy discomforts to my Gynae when I saw her, just in case I forgot to bring them all up during the consultation. I might forget to list all the pregnancy symptoms I felt in the past month if I don't feel such symptoms when seeing my Gynae on the actual monthly visit. Thanks to my husband's reminder, I managed to tell my Gynae my main pregnancy discomforts in the past month - especially since my tummy is getting bigger and bigger each day. They are breathlessness, pains on my right buttock and upper thigh as well as throbbing headaches. My Gynae remarked that all these pregnancy symptoms are normal and not much I nor she could do to eliminate the discomforts. Breathlessness during pregnancy normally happens when the growing baby and mother's uterus start pushing the mother's lung. Pains on my right buttocks and upper thigh are joint pains during pregnancy and can be calmed by putting a warm water bag or hot towel on the painful part. In short, I just have to bear with all these symptoms until my baby is born. During our conversation with the Gynae, I also touched the 'labor' topics too. In principle, she encourages me to have a natural birth if there are no complications with my baby. Natural delivery in a private hospital in Seremban usually costs less than RM 2,000. Should I find the labor pains too unbearable, epidural can be used as an alternative aid during the baby's delivery. Epidural alone would cost around RM 900 if given during the day and is priced few hundreds more than RM 900 if administered at night. She would do Caesarean section on me if my baby's face doesn't point down or she is in a breech position at the time of the birth. Caesarean section in a local private hospital costs around RM 5,500 to RM 6,000. Last month, my Gynae mentioned that my baby's estimated delivery due date would be on 20th of September 2012 (at 40 weeks gestation age). However, some babies can be born at 38-39 weeks of pregnancy and they are still considered 'full-term' babies. Say, if I deliver my baby at 38 weeks of gestation, her estimated birth date would be around 6th-7th of September 2012. This said, I might have the chance to hold my baby exactly on my birthday this year (7th of September)! Although nothing much my Gynae could do to confirm my actual baby's delivery date but she prefers me deliver my baby earlier as when my baby gets too big in my uterus, it'd be harder for me to get her out! Moving on, my husband popped the question to my Gynae if she could do a 3D or 4D ultrasound scan when she was doing her usual ultrasound scan on my baby yesterday. She said yes! After she completed the 2D ultrasound scan on my baby's position, head, eyes, nose, lips, body, beating heart, arms and legs; my Gynae let my husband and I have a peek on our baby's face for the first time using the 3D ultrasound scan. The last time I saw my baby in 3D ultrasound scan, she gave me her backside's look. My baby girl at 25 weeks and 4 days: See how she opens her mouth when she's relaxing? with tall nose bridge and large ears, I reckon? The 3D ultrasound scan: A shy baby who seldom shows us her whole face during ultrasound scans. Err.. It is obviously too early to tell but from the above photos, I'm guessing that my baby girl would look more like her Daddy when she's born. Can't wait to prove it. We were so happy to learn that our baby is very active in the morning and during the day even though she kicks up a storm too at night. My Gynae explained that usually unborn babies are more active at night as their natural bio rhythm makes them more awake at night. That's why newborn babies cry or wake their parents up more after sundown? Last but not least, before I went home yesterday, I was given my first dose of anti tetanus injection. Not sure when I'd be given the second one but this jab stung me pretty badly. This shot's side effects on me were sore (left) upper arm, mild fever and muscle pains. I felt them not long after I left the hospital and still feel them as I type this post. Doctor bills: RM 132.80 (for the Gynae's consultation fee, urine laboratory test, anti-tetanus injection, multivitamins and fish oil capsules). I experienced pregnancy breathlessness yesterday morning and must say that it gave me quite discomforts. While I tried to relax myself by doing nothing, the shortness of breath was still there. In the end, I decided to keep myself busy in the kitchen by testing some recipes instead of just sitting in front of my laptop or lying still in my bed for hours. I made Pandan Chiffon Cake and a traditional Indonesian steamed layer cake (Kue Lapis) commonly sold in local wet markets. Although I was a bit tired after baking the chiffon cake, since I had the mood, I continued making this Kue Lapis in the afternoon. I thought of doing whatever things that I enjoy while I am still pregnant and because I still can. It is not that I won't be able to do all my hobbies again after I have a baby later on, it's just that things are a little less complicated now with my time management. Anyway, here is the recipe of the Kue Lapis that I made yesterday. I used the recipe from an old cook book I bought in Indonesia many years ago. This book is intended for beginners in the kitchen and the recipe for this Kue Lapis doesn't use rice flour but uses mungbean flour (tepung hunkwe) instead. First trial of making Indonesian Traditional Kue Lapis. 1. Bring to boil the coconut milk, pandan leaves, vanilla extract and sugar. Let the liquid cool for a while until it is not too hot too handle. Then, run it in a strainer. Set aside. Boil the coconut milk, pandan leaves, sugar and vanilla extract. 2. In a separate large bowl, combine starch, flour, mungbean flour and salt. 3. Gradually pour the warm strained coconut milk to the flour mixture. Mix well by using rubber spatula. 4. Divide the mixture to 3 parts. Give green and red colorings to two parts of it and leave the last part white as it is. Divide the mixture into 3 different colours of choice. 5. Put 2-4 serving spoon/ladle of the white mixture into a loaf pan already greased with vegetable oil and covered with plastic. Steam the first layer in a preheated steamer for 10 minutes. Use big fire to steam this Kue Lapis. and covered with plastic for easy release. 6. Pour another 2-4 serving spoon/ladle of the red mixture on top of the white mixture. Make sure the measurement of the mixture for each layer is the same. Steam for 5 minutes. Steam each layer of the Kue Lapis for 5 minutes. 7. Pour another 2-4 serving spoon/ladle of the green mixture on top of the red mixture. Steam for 5 minutes. Repeat these last three steps alternately until the all mixture is finished. 8. Once the last layer is poured to the pan, steam the whole Kue Lapis for 25 minutes before turning the stove off. 9. Release, cut and serve the Kue Lapis once it is completely cold. To achieve nice and smooth Kue Lapis slices, cut the Kue Lapis by using a knife covered with plastic and greased with a little bit vegetable oil. Cut and serve Kue Lapis when it's cool. In my opinion, making this traditional Indonesian Kue Lapis is not difficult but the whole processes really test one's patience and endurance as we need to create the layers one by one and steam each layer for 5 minutes before adding another layer. There were times when I wanted to quit making it halfway but luckily I managed to pull through. I am happy that I finally tried making Kue Lapis by myself and pretty glad with the result too. Surprisingly, the kids in my house also love eating this Kue Lapis. In the future, I think I might just want to buy this kind of Kue Lapis from outside as making it at home indeed takes a lot of time. Nevertheless, if you are determined to try making it yourself or crave it terribly (and you are not in Indonesia), give this recipe a try. My husband loves chiffon cakes best. Since he told me that in general he only enjoys eating chiffon cakes and plain butter cakes, I felt compelled to bake a chiffon cake (again) for him. Although I have baked chiffon cakes many times before, this time around I wanted to experiment with different chiffon cake recipe that assures me with a really tall and firm cake result with fluffy texture - basically, a perfect and failure-proof chiffon cake. I browsed lots of chiffon cake recipes in the internet, considered some of them and finally decided to try the one from a trusted source here. This recipe uses more eggs and slightly different beating techniques from what I had been practising for the chiffon cake batter. Also, given the positive reviews from those who had tested this recipe, I thought this recipe would be my super safe bet. The original recipe uses lemon extract for the chiffon cake. As I wished to bake a plain chiffon cake with flavours from natural ingredients, I used the juice of fresh pandan leaves that I once planted and coconut milk (instead of cold water) for the chiffon cake batter. I have made a chiffon cake using fresh orange juice before so I thought of not baking one with citrus flavour again for the time being. Anyhow, pandan flavoured cakes are still all-time favourites for young and old Asians. Without further ado, adapting from the original chiffon cake recipe mentioned above; the following is the recipe that I used for baking my chiffon cake earlier today. As usual, I reduced the amount of sugar for the cake batter so the cake's final result will not be too sweet for adults' palates. Favourite Pandan Chiffon Cake I baked today! In a small bowl, mix together coconut milk and fresh pandan juice with a spoon. Set aside. Combine the sifted flour, baking powder and white sugar in a bowl. Make a well; then add oil, egg yolks, vanilla extract, coconut milk and pandan juice mixture plus green colouring to the well. Set aside. Do not beat first. In a separate large mixing bowl, beat egg whites with high speed electric mixer. Gradually add the cream of tar-tar while beating until the egg whites turn very stiff and form soft peaks. Set aside. Using the same beaters, beat the egg yolk batter at a high speed until smooth and light. Gradually fold the egg yolk batter over the egg whites mixture by using rubber spatula. Do not stir. Pour the cake batter into a tube pan (do not grease the pan). Once done, shake the pan a little bit to release the air from the cake batter. Bake the cake in a preheated oven for 55-60 minutes until done. Do not open the oven until the cake is baked for minimum 40-45 minutes to avoid shrinking chiffon cake. Once done, invert the pan to cool and release the cake. My Pandan Chiffon Cake: Fresh from the oven and ready to be inverted. Isn't it a tall chiffon cake? Honestly, I was incredibly happy with the result of this chiffon cake recipe. I had a really tall, fragrant and firm chiffon cake with super moist and fluffy cake texture. The cake did not shrink when it's cool and I didn't have to drink so much water after eating a slice. I think this one was by far the best chiffon cake I've ever baked. This recipe didn't fail me and it looks like from now on, I'd be using this recipe for my chiffon cake bakes. This chiffon cake just made my Friday afternoon! In conjunction with the coming Father's Day in June, in late April, BabyTalk Malaysia Magazine threw a question in its forum on the fondest memory one's had with her Dad. The editor encouraged the readers to send their photo with their Dad and a little story about their most memorable moment with Dad as soon as possible. The selected photos and story would be featured in the magazine's Father's Day edition. I quickly jumped into the bandwagon. I tried to find a nice photo of me with my Dad and immediately wrote a little story about it then sent them over to the magazine's editor via email. BabyTalk Malaysia's June 2012 Edition. To my astonishment, when I was hunting for the magazine's latest issue yesterday night, my photo and story are featured in it. It is not a full page coverage, one page article or anything like that, but this magazine's feature left me ecstatic enough for the whole last night. On top of this, with this feature, now I can cross item no. 78 in my bucket list too. Here are my photo and writing that are featured in BabyTalk Malaysia's June edition on page 95, under the Father's Day Tribute Section. The one I circled: That's mine! The wedding photo I chose for the challenge. What I say about my fondest memory with my Dad. I was so happy the moment I discovered my pictures and story featured in the magazine when flipping through the magazine's pages in the magazine stall last night. I could not contain the excitement, thus, the first person I showed my picture to and told that I appear in the magazine that I was going to buy was the magazine stall's owner in her cashier counter, right before paying her. She went like, "Oh, ya loh!" Then, came my husband who was equally surprised when I shared him the news. By the way, early last month, I got a call from the magazine's editor to do a maternity dress photo shoot in Kuala Lumpur after I sent two of my maternity pictures to her. Unfortunately, my husband was very sick and in hospice care longer than I thought, hence I missed the chance to be their model! I mean who knew that I'd have the chance to do modelling opportunity with protruding tummy and chubbier cheeks like now! Anyway, the ordeal was not fated and the good thing is I am still featured in their magazine in another way and am very happy with that. Time flies. Without realizing it, I am already almost on my third year of permanent stay in Malaysia and just applied for my third year's long-term visit pass in Malaysia this morning. For the record, the processes and required documents for extending the long term visit pass as a spouse of Malaysian this time around were exactly the same as what my husband and I did last year. However, today I figured that applicants can actually request more than one year of visit pass extension in Malaysia. This means, we don't have to extend our visit pass in Malaysia on annual basis - instead we can ask for 2 or 5 years extension pass at one go, then only try to apply the Malaysian PR status (after 5 years of continuous stay here). If I knew about this much sooner, I would have done so last year to save the fuss in dealing with all the tedious paperwork in the local Immigration Office every year. As for my case, I was unable to apply the 2 or 5 year visit pass today because my passport is expiring in less than 2 years' time so I would need to come back to the Immigration Office again (with my new passport book) for the same purpose next year. To apply for 2 or 5 year visit pass in Malaysia, all we have to do is write the desired length of stay in Malaysia (1, 2 or 5 years) under the Period of Extension Sought in the Application for Extension of Visit Pass Form (Permohonan Lanjutan Pas Lawatan) - orange coloured paper. After that, crossed fingers, on the next day, we'd get the visit pass sticker, with the wanted number of years, granted on our passport book. Another lesson learnt today was to have our Malaysian spouse's presence in the Immigration office when doing all the paperwork for our visit pass at all times. My husband asked me to submit the completed forms and other required documents to one of the Immigration counters by myself as he had to run some errands in town. By the time I was called by the officer to submit the documents, he asked for my husband. Since my husband was not around, I had to queue all over again and wait until my husband came to the Immigration office to submit the documents together. Having said this, don't even think of delegating our spouse's role to our Mother-in-Law, Father-in-Law, relative, best friend, neighbour nor having just ourselves in doing or submitting the visit pass documents for Malaysian's spouse in the Immigration Office. The physical presence of both applicant and the stated guarantor is required. On another note, my husband managed to ask one of the immigration officers on the citizenship status of our child once she is born. It looks like my child will have to follow her father's citizenship, hence becoming a Malaysian, instead of having dual citizenship as I always thought. Nonetheless, when I have the opportunity, I still would like to be in touch with the Indonesian Embassy in Kuala Lumpur to confirm this matter.